In “Hands Over The City”, Francesco Rosi’s scathing depiction of municipal corruption in 1960’s Naples, this is about all the action you are likely to see. Although the film depicts a murderous cauldron of avarice and greed, there are no scenes of violence and assassinations. All the action is derived from the bombastic, explosive reactions expressed by the politicians. If this film had been made in any other country it would have fallen flat, but the Italian personality can squeeze entertainment value out of the driest of subjects. The film might seem dated, characterized exclusively by middle-aged white males, but the principles of municipal corruption, in this case involving zoning and construction, remain immutable, as exemplified by the recent attempt by former New York City Council President Christine Quinn, who was a handmaiden of New York real estate interests, to gain the mayoralty and access its infinite pipeline of money by mobilizing the city’s gay vote. You got a movie right there, and no moralistic “Harvey Milk” redemption theme, but potentially a gripping narrative about the transformative evolution of greed. She lost, of course, to De Blasio, whose multi-racial, multi-sexual campaign managed to touch all the identity bases, and who had the significant advantage of not being beholden to any interest groups. New York City has moved to the Left, and away from the landlord-friendly policies of Rudolph Giuliani and Michael Bloomberg. Across the Hudson River, in New Jersey, municipal corruption and wheeler-dealing is less nuanced and more explicit. After New Jersey Republican governor Christopher Christie was revealed to have applied high-pressure electoral tactics against the Democratic mayor of Fort Lee by creating a massive traffic jam on the George Washington Bridge as revenge for the Democratic mayor’s refusal to endorse him in the last election, the Democratic mayor of Hoboken, Dawn Zimmer, felt emboldened to reveal Christie’s refusal to release FEMA emergency relief funds for damage caused to the city by SuperStorm Sandy unless she threw her support behind a riverfront real estate project that Christie’s gang desperately wanted. Male, female, gay straight, you name it – everybody’s following the money. Zoning kickbacks and bribery are the Holy Grail of municipal politics. When I was younger a lot of people asked me why I never took an interest in politics and, implicitly, all the opportunities to wheel and deal. The back-room maneuvering of it never bothered me as much as the socializing and retail politicking, pretending to care about people’s concerns, which characterize the process. I live in New York precisely so I don’t have to care about other people. Besides, unbeknownst to my interlocutors, with my biographical record I couldn’t get elected Dog Catcher. 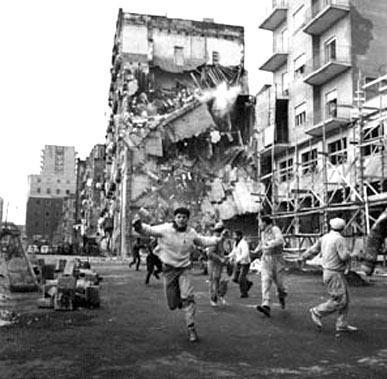 The film opens with a building collapse in an ancient downtown quarter of Naples that results in several deaths and the amputation of a young boy’s legs. 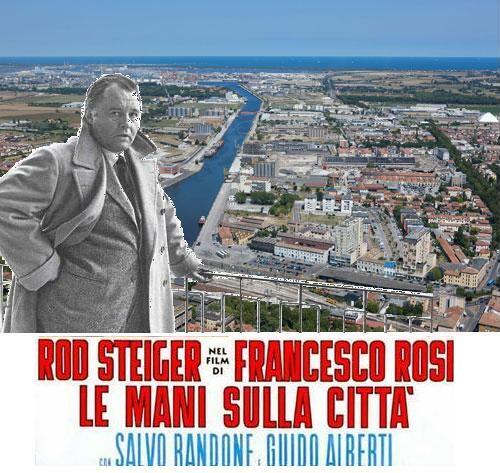 The voracious developer, Nottola, fiercely played by Rod Steiger, also has a seat on the city council. He nourishes the ambition to become city building commissioner, in order to rezone a parcel of land he has bought up just outside the city limits from agricultural use to residential construction, multiplying the value per hectare by a factor of 70. Since it is an election year, the Communist opposition leader tries to use the building collapse tragedy to convince public opinion to throw out the center-right coalition from power. That’s the premise of the film in a nutshell. Though corruption, organized crime and the Neapolitan Camorra mafia are constantly alluded to, no acts of violence or cruelty are shown. The film derives its tension from the conflict and resolution of the characters’ interests. The back room hectoring, complaining, backstabbing and double-dealing between the voluble, elegantly accessorized silver-haired political wheeler-dealer back room sharpies is a joy to watch. Here in the U.S. we don’t have any shortage of comparable material. The problem is in the execution. “Hands On The City” was a big budget movie requiring a large cast of extras to portray the city council meetings and political rallies. It’s not conceivable that big U.S. producers would consider such a risk, and independent filmmakers don’t seem to have the talent to break out of their mode of basing films on hackneyed road movies, coming of age retreads and the pointless examination of idiosyncratic eccentrics. I have often dreamed of making a movie about Louisiana populist politician Huey Long, who was a monster string-puller and manipulator, and almost posed a threat to sitting President Franklin D. Roosevelt, only to be cut short by an assassin’s bullet. The films about him, notably “All The King’s Men”, starring Broderick Crawford, fell short because of uninspired screenwriting. What’s wrong with this picture? You got the resources and the budget. You got the cast lined up. Why not include some compelling story lines and dialogue? Somehow, all these American politician movies are derivations of the already stale Tom Sawyer cliché about the countrified sharpie tricking the other hicks to whitewash Aunt Polly’s picket fence. The dialogue is stunted to the point of retardation, and the film invariably presents a storyline of a single thread, instead of a Byzantine fabric of intrigue and betrayal. The Criterion Collection has released “Hands On The City” as a two-disk set which includes an absolutely fantastic follow-up movie made for Italian television depicting director Rosi’s return to Naples thirty years later (1992), to preside over a symposium given at the University of Naples, where a number of distinguished academics, architects and engineers give their perspectives concerning past events, from the Roman Empire to the present, and the future prospects for the city, which, they remind us, has nothing to envy about Paris or Rome. 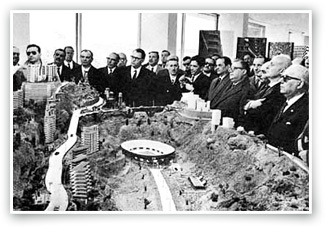 The subject matter is not the least bit dated, and is relevant to the development of every city in the world. The viewing experience is enhanced by the compelling cinematography achieved by Gianni di Vananzo, who shot both movies, the first in the stark post-WWII neo-realistic style characterized by the films of Roberto Rosselini, and the follow-up adapting the magical realism formula popularized by Federico Fellini, which displays ancient and modern Naples in all its stunning grandeur.